Given the history of privileged white outsiders claiming the "truth" of marginalized lives better than marginalized people themselves—and the exercises of power which such claims have enabled—the author's choice to center himself is reprehensible. For me, everything indefensible about this story gets crystallized in the overwhelmingly inappropriate narrative this text tells—all the voices of the incarcerated are all appropriated and falsified by a white cis-hetero male academic outsider—while their identities, experiences, views, fears, and yearns are screamingly absent from the book and the framing. Jeffreys has one set of attitudes toward incarcerated people in theory, and a very different practical relationship to actual prisoners in his book. Reading the cover against the grain, I scramble around for the worst words I can find to describe a book that literally begins with the promise of "[h]ighlighting the experiences of inmates themselves [in order] to shift public perception and understanding of jail inmates to center their inherent dignity and help eliminate the stigma attached to their incarceration" and apply all that to the author who would write a book, ultimately, that would insist we look away from them as the real victims of a terrible reality and instead use them as philosophical "tools"—tropes, caricatures, and anecdotes—to fluff up a privileged "intellectual" discourse armed to perpetuate the logic of white supremacy by dignifying some salvific savior figure (typically the police, the reader themselves, and almost always Jeffreys himself as well) against the oppressed. Part of fighting for truth is paying close attention to quality of method and the constructions of arguments—evidence, form, and logic. In this review, I will demonstrate some of the ways this book functions as a colossally exploitative, philosophically hollow, and willfully ignorant "pseudo argument" rooted in only minimal truth claims and references to reality in order to craft shockingly simplistic solutions for a massively complicated political-economic-military problem. It may be too much to insist that this project is a fascist disinformation campaign motivated by the author's repugnant evangelical religious beliefs and "Right on Crime" conservative politics with a direct investment, literally, in funding new jail project, namely those that allocate money to private Christian-centered faith-based initiatives, but that's what I'm most comfortable calling it. (These comments are distilled from extensive notes published in Swartz 2019). From the beginning, the concerns that actually motivate the narrative are deeply and fundamentally very clear: Jeffreys wants to burnish the public perception and reputation of the police and prison guards, who he sees as a the real victims "in what has become known as mass incarceration" (p. 10). Right off the bat, then, this project lodges itself deep in the realm of mythical dehumanizing spectacle and confines itself to that narrow interpretative capacity, when Jeffreys insists on presenting police and prison guards as the new Troops™ in urgent need of appreciation against a manipulative smear campaign waged by the media who demonize them in popular television shows and films about jails. The argument is that such depictions persist in our public imagination with negative results, tapping into our into our fear of the "Other," so that whenever we learn of new accounts of disturbing jail abuses, our knee-jerk impulse is to demonize them. The best way for Jeffreys to express this desire is to frame it in common-sense and intellectual-term negative terms: by resisting the impulse to stigmatize the "many" good cops. Such framing is enabled when Jeffreys invokes the term "marginalized" as a way to "refer to those whom the jail targets," while simultaneously (and inexplicably) expanding its definition "in a moral and nonmoral sense to include a variety of people" to both "those who commit terrible crimes and evil acts that endanger others," as well as "those whom a community finds (with or without good reason) problematic, different, risky, or annoying" (p. 5). "Undoubtedly, the U.S. penal system contains no shortage of abusive personnel: corrupt judges, power-hungry sheriffs, pandering prosecutors, and violent and abusive correctional officers. However, I resist the temptation to demonize those working in corrections. Corrections officers have very difficult jobs, and on a daily basis deal with troubled and violent people. I have met many corrections personnel who struggle to make positive changes in a broken criminal justice system. In this book, I will feature people who accomplish remarkable things in horrible circumstances." (Emphasis added). Now, there are several things to say about the above passage, but let's start with claim itself: Jeffreys' point is so sharp that it becomes narrow, and there's a begged question that holds together everything as follows: What popular television shows and movies has he been watching of late? He doesn't say, but a basic investigation suggests that police are routinely portrayed as noble, risk-taking, selfless, altruistic people who sacrifice themselves for the good of the community and are constantly put in harm's way by evil or crazy criminals. Indeed, television and movies are drowning in military worship, sexism, racial stereotypes, jingoism, and police propaganda. As for the widespread demonization of cops by the public? A Gallup poll in late 2017 found that 56 percent of Americans rate the honesty and ethical standards of cops as high or very high, an approval rating comparable to high school teachers and dentists—hardly your typical villains. Only 12 percent of respondents had low or very low opinions of police honesty. And this is not a reflection, for the most part, of people's actual interactions with police. It's the reflection of how television dramas and local news specifically portray cops (Norman 2017). Beneath the astounding irrationality of Jeffreys' project is the fact that these kind of white savior hero fantasies are easy to indulge and that they find such a quick and easy purchase in white minds (which is to say, minds that insist on being white by taking something like this seriously). Yet, to discount the very narrative techniques for which this book was (allegedly) reviewed, edited, and published as a non-fictional "alternative criminology" text by a reputable academic press; even garnering such ebullient praise from two scholars who called it "groundbreaking" and a "[p]owerful condemnation of America's jail system" is to show how these qualities might actually make Jeffreys the exception that proves the more generally racist rule. Which brings me to my second point: the rhetorical tics and modes of prose and discursive that allow Jeffreys to set the terms for his framework. As it turns out, Jeffreys is a virtuoso at evincing a short-term awareness to potential linkages with larger systems and structures, only to immediately reterritorialize around the non-political solutions and the savior implementing them. That is, to center the experiences of exceptional cops and prison staff, Jeffreys uses a neat rhetorical double-move that allows him to feign agreement with a larger reality of pervasive and systematic state-sanctioned abuse and violence towards the incarcerated by briefly acknowledging it only to ultimately deny it. It's a self-contradiction best handled by crafting a caesura between the real abusive state expressed in the negative (undoubtedly he understands that there are no shortage of abusive personnel) with "the many corrections personnel who struggle to make changes in a broken criminal justice system." The result is the illusion of a compelling sounding claim proffered by someone who appears to be carefully and intelligently thinking things through and considering both sides while quietly (and quickly) relegating the very real physical and psychological violence against the incarcerated to the realm of consumable spectacle by dispossessing its political and moral demand. The result allows Jeffreys to effectively hide away the actual suffering and brutality occurring within these torture chambers everyday (and outside on the street) under the assumption that such violence is overexaggerated and perpetrated by subset of individual rogue cops. While this tactic comes dressed in a veneer of concern and moral parity that's a nothing more than a performative way to pathologize criminality and victim-blame. It also has no basis in reality. Indeed, the elements that define the book have evolved by now into a unique and inimitable style, one well-suited to an "post-racial" era seeking a condensed, comfortable, feel-good, even fun, account of societal carcerality. In this sense, this book almost immediately identifies itself as a hit among a wider (and whiter) audience of policy makers and public alike, particularly in a political environment favoring privatization. A close reading of this book reveals not only the author's deep reluctance to challenge the existing system. Jeffreys focuses on jail as "thing"—a structural site of incarceration delinked from the historical conditions that produced it or for which it serves as useful. Now, I am not questioning this book on the grounds of historical accuracy because if you wanted historical accuracy, you would not read this book at all. The way Jeffreys deals with anti-black and anti-poor gendered racism is the same way he deals with all of his other absolute negations: acknowledging it so he can dismiss it entirely. That is, Jeffreys is careful not to dismiss race entirely as a factor driving hyper-incarceration, and to drive this home, he invokes a mild academic characterization of disproportionality and his own "non-racist" credentials. Still, by relegating race to the periphery, he can effectively ignore it. "African Americans are incarcerated at disproportionate levels throughout the United States, often because of policies going back decades. For example, my home state of Wisconsin incarcerates a higher proportion of African Americans than almost any state in the union. Throughout this book, I will highlight how race affects jail life, but will not make it central to my analysis. Instead, I will highlight the dignity of the person, and how our penal system degrades and damages it" (p. 4). There's a lot to unpack here. First, consider the second-half of the first statement: "often because of policies going back decades." That "often" is doing major ideological work as it reflects a common talking point in our impoverished national discourse about the criminal justice system: the refusal to believe that race is always playing role. Rather, police violence results from a series of bad individual choices by the victim, never situational terms, allowing anti-racism to be dismissed as nothing but a moral panic: an unfair accusation or an unhelpful diversion from a presumed bigger picture. This is important. Missing from this narrative are any attempts to explain the bad behavior of prisoners incarcerated by reference to their situated context – poverty, race, gender identity, coercion, and so on. Rather, the author attributes their bad acts to their inner lives and motivations – their (lack of) character. According to Jeffreys, "free choice" compels them to act badly, not situational terms. However, this gets completely turned on its head when the author and his cops friends are the ones committing bad acts: as we learned earlier, their behavior is always explained in situational terms—"the character and culture of the institution…[g]roup pressures, horrible conditions, job insecurity, and other factors that constrain choice in penal settings" (p. 153). Throughout the book, he worships "conscientious corrections officers" and "dedicated" and "committed" prison staff who, according to him, "strive to respect the dignity of inmates" but "confront a Herculean task" working with "a profoundly disturbing group of people" in such "a toxic environment of constant distrust" that takes a huge "moral and personal toll" on their individual lives (pp. 28-29; pp. 152-153). Get the distinction? When correctional guards and cops do bad things it's because of the circumstances they face – the conditions in the jails including the alleged disgusting bodily waste of inmates themselves. But when those living in jails do bad things—choose to mutilate their own bodies via self-harm, refuse to take their medications, routinely damage property, and engage in "inmate-on-inmate and staff violence"–it is never the result of their circumstance (anti-black racism, homophobia, transphobia, poverty, sexual abuse, neglect, or any combination thereof), nor is it an acceptable act of self-defense against the widespread and constant violence directed at them; rather, it's a matter of their bad individual character. When Jeffreys commits a logical error this glaring—and when he rests a good chunk of his worldview on the error—it's hard to escape the conclusion that something deeply pernicious and ideological is biasing the author's cognition. Which is to say, Jeffreys has written a book where the most victimized and vulnerable are rhetorically erased and do not exist. There is not a single sympathetic voice for prisoners in this 225-page book that claims to be for and about them. For Jeffreys, the "good" prisoner is a non-problem and a non-person. But worse, where the incarcerated individual is acknowledged to exist at all, they are encapsulated in a series of offensive stereotypes which render them variously evil, passive, dangerous, violent, crazy, or simply unwitting that serve either to repeat his conclusions back to him or to as a negative object. Their knowledge—subjugated and marginalized—would have provided an alternative much-needed truth to the authors' dissembling definition of penal reality. For Jeffreys, (what is taken to be) reality is an ersatz account of an essential jail experience that begins with himself and is much more in service of the experience than it is to external facts and context. The substance for this book, as it were, is based on two special access jail tours of Chicago's Cook County, in 2013 and 2014, where, as an "authorized visitor" (p. 15) of the warden, Jeffreys' privilege and mobility to "stumble," by chance, in and out of events, "to describe some of the conditions that inmates experience" (p. 16); which is certainly a far cry from the "full understanding of the jail experience from the inmate's perspective" we were promised on the cover. And only eight pages later, this interpretive framework narrows into the ever sharper terms of "a snapshot" (p. 24), of what he witnessed, as representative of jail, as it "really" is. It's a research approach that sufficiently indexes the way this book wants to make the author both the master of spectacle and the primary subject of sympathy (by evoking consequential contempt and crass instrumentalization for those who are vulnerable enough to be used). Jeffreys is the interpretive guide to a colonized underworld with whom a specifically white "we", the privileged and largely white audience, can identify. Sharing his perspective with the reader, he makes the space knowable and digestible. Thus, the reader's identification with Jeffreys gives them a safe passage and allows them to act as comprehending voyeurs. Jeffreys claims that this is first and foremost a "philosophically sophisticated perspective of phenomenology" (p. 175), which is certainly a bunch of words. In this book, Jeffreys proposes an ontological shift, or a new orientation toward "old values" that mirror the American and Puritanical tradition by tying an ill-defined, ideal concept of "human dignity," defined by a capacity for autonomy, reason, and self-transcendence, to a symbolic notion of stigma as a "spoiled identity" (a la Goffman), to claim that "negative affective responses" such as disgust (and its kin: concept and fear) directly dehumanize the currently and formerly incarcerated. What are the objects "we" find disgusting? Jeffreys insists that the degrading aesthetics and the horrific sanitary conditions of jail combined with the corporeal decay of prisoners and the "fact" that "we find vices and crimes disgusting" means that disgust is a "natural" emotion with high morally relevance for the context. In a complete collapse of political ethics, Jeffreys introduces the ableist concept of "value blindness," defined simply as "the incapacity to recognize the centrality of a value" (p. 100) to claim that "disgust and contempt lead some staff to abuse inmates" (p. 100). "Degrading conditions within jails often invoke only further disgust. When jails allow people to live in cells with barely functioning toilets, they create revolting conditions. When authorities refuse to offer medical intake examinations, inmates may import diseases with outward symptoms that elicit disgust. When officials fail to provide psychotropic medications to those who need it, inmates may decompress, and fail to clean themselves. When cells swarm with insects and rodents that find their way into food, staff members can hardly contain their disgust" (p. 110). Let's linger over these words for if there's any poetry to this odious monstrosity of a book, this is a wonderful example of it: the words that don't quite, can't quite, say what they really mean, and yet somehow still do. When jails allow people to live in cells. When cells swarm with insects and rodents. Jeffreys sounds as if he is narrating germs in a petri dish. This isn't just a badly written book (though, good lord, it is that); this is a book that is disgustingly willing to place the burden of indignity on the bodies of victims, and then call it "growth" or "transcendence" (or whatever) when their abusers finally come around to seeing them as people who possess goodness and individual value. Be patient. Wait for people to change. Serve as an object lesson. As far as I'm concerned, this is all a ludicrous load of ideology. Certainly if people are capable, then can also be accountable. A final general criticism troubles the gospel of this book's messianic evidence. 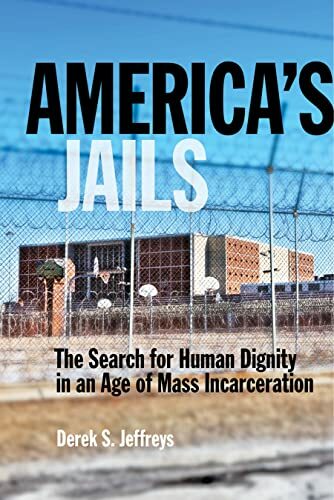 From his own account, Jeffreys' entire project is shaped not by carefully considered research design but by his relationships with veteran prison guards who, he writes, "acknowledge that negative emotions can blind them to the dignity of the inmates" and "have convinced me of the significance of free choice in jails and prisons" (p. 152). Foremost, opinions and gut theories require empirical support. How Jeffreys' personal experience and the opinions and statements of the police are worth anything of value in this conversation is beyond me. It should be obvious that any explanation of institutional change that hangs on official claims of the police themselves is always inadequate, even if—and this is a crucial caveat—they are honestly conveying what they think they are doing and why. What we know objectively is that they lie all the time. Did anyone at New York University Press insist upon support or verification for these claims? Cole, Teju. 2012. "The White-Savior Industrial Complex." The Atlantic, March 21. https://www.theatlantic.com/international/archive/2012/03/the-white-savior-industrial-complex/254843/. Accessed February 9, 2019. Goffman, Erving. 1963. Stigma: Notes on the Management of a Spoiled Identity. Englewood Cliffs, NJ: Prentice-Hall. Norman, Jim. 2017. "Confidence in Police Back at Historical Average." Gallup, June 10. https://news.gallup.com/poll/213869/confidence-police-back-historical-average.aspx. Accessed February 9, 2018. Swartz, Anna. 2019. "Notes for a Review of America's Jails by Derek Jeffreys. [Blog post]. http://annaswartz.com/2019/01/notes-for-a-review-of-americas-jails/. Accessed February 9, 2019.